Bunwich: Solution to Atheros AR9285 Wireless Card - Pinging works, but browsing the web does not. Solution to Atheros AR9285 Wireless Card - Pinging works, but browsing the web does not. A few years back I purchased a Compaq CQ62-215DX notebook for $300.00. Based on the AMD V120 CPU, it is all the power you need to watch movies, run microsoft word an surf the web. Recently I updated some drivers, or I think I did during a routine Windows Update, and afterwards I was unable to surf the web. I was able to ping google.com/yahoo.com, but could not retrieve pages for major web sites. Other laptops worked so I knew it wasn't a router issue. Doing a search yielded plenty of results with people having the same problem. Netgear WNDR3700 - has b/g/n and supports 2.5 and 5ghz. 150mbps to 300 mbps. There are about 2-3 driver packages on hp.com and the sketchy www.atheros.cz site. I probably installed these 20 times and still got no connectivity. Not to mention the Auto Update Installation on Windows 7 home would keep trying to install the old drivers without my permission. (gpedit.msc is not available on windows 7 home which lets you stop this from happening). After spending a few days researching, I stumbled upon a post on the hp forums where a user who had an ASUS laptop turned off the Wireless Mode from Auto to b/g and then was able to connect. Problem is when you go to device properties for your wireless network card you may not have a Wireless Mode setting. I reinstalled all the old drivers to see if there was a wireless mode setting in previous versions and nope, HP did not make these settings available. 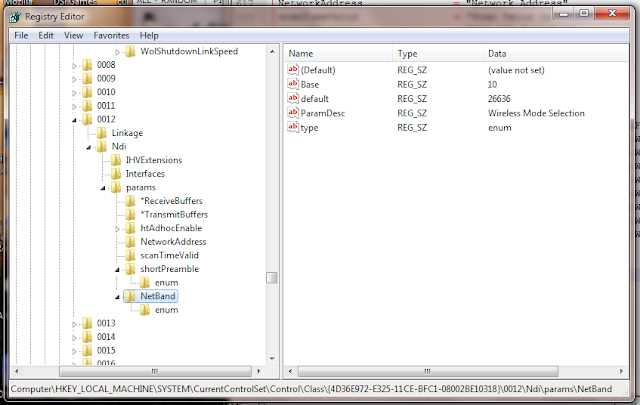 The next step was to determine where in the registry the advanced settings for the atheros wireless card were located. Long story short I was able to track the location of the registry keys used to configure the device, and I found a bunch of registry settings in the .inf files from the atheros.cz drivers. Next would be to add the registry settings to my Windows 7 registry. TLDR; Wireless N did not work on the AR9285. Might be hardware, might be drivers. Whatever is I had to turn it off so that I could at least connect to the internet. From the .inf file in the atheros.cz we have these settings. 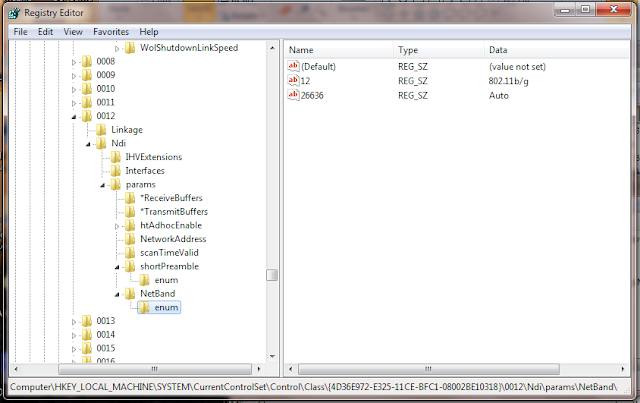 To find where, I did a search for "Adhoc 11n" in regedit.exe. This is one of the settings you can choose for your drivers and it seemed unique enough. I only found two cases of this in my registry so I decided to add the above keys and values next to the Adhoc 11n. One of these had to be the correct settings for my device. Lucky for me the first one I chose happened to be the right one. After doing this, go to your wireless network card, click properties, configure, advanced and you should now be able to choose b/g or auto. Set it to 802.11 b/g and hit OK. Your wireless connection will restart and hopefully you will now be able to connect. It did for me. Woot! NOTE: For those who have a little more time and effort, or maybe someone at HP can figure this out - change the .inf file and add above registry fields so we can configure the Wireless Mode. This would save a lot of people time and effort. You are a genius. I've been battling against this for a week now. THANK YOU SO MUCH.